Alzheimer's is a growing worldwide problem. 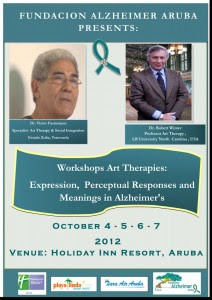 Below, I have posted an invitation from Alzheimer's Aruba to a conference they are having for caregivers. You are cordially invited to participate in a 4-day Workshop on Art therapies with Professor Dr. Robert Winter (North Carolina, USA) and Professor Dr. Victor Fuenmayor (Estado Zulia, Venezuela). Don't Miss this opportunity to learn from the experts in communication with the Person with Alzheimer's or related disorders. The emphasis of this 4 day workshop is “how caregivers can cope with the emotional processes, in his/her individually care-giving process." A workshop for caregivers and professionals in the field of Alzheimer's and related conditions. Click here to view the brochure for this Workshop. For more information: alzheimeraruba@gmail.com Please feel free to forward this invitation on to your Family, Friends, Colleagues, especially to caregivers, struggling with the issues regarding communication and coping with a loved one with Alzheimer’s and related conditions. Translation in Papiamento and Dutch is available.